We had a large blank wall behind our living room sofa. For years, we struggled to decide what to do with it. Buying a painting or mirror that large was out of our budget, so we tried a collage of smaller pieces, but they looked too messy for such a focal point in our main living area. Then, while travelling through Tennessee, my husband came across some old potato sacks. He brought them home to me as excited as a school boy, telling me how he could “upcycle” them by building a frame and hanging them on the wall. 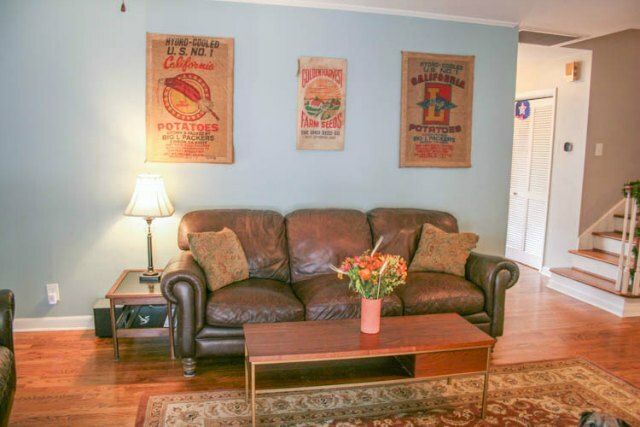 While I was thrilled that my efforts had finally rubbed off on him enough for him to spot an awesome upcycling opportunity when he saw one, I was very skeptical of the idea of an old potato sack on my wall. But once we started working on the project, I began to see how the vintage look could work well in the space. It also got me excited at how easy it was to do, prompting me to start stockpiling old t-shirts, quilts and other fabric items with sentimental value that we can “frame” and use as fun, funky wall art. Measure the potato sack fabric to determine how large your frame will be. Cut the plywood into four pieces to fit together into a rectangle. Screw the four corners together using a Kreg jig. If you don’t have one, you can use a drill and some screws. Slip the material over the frame. 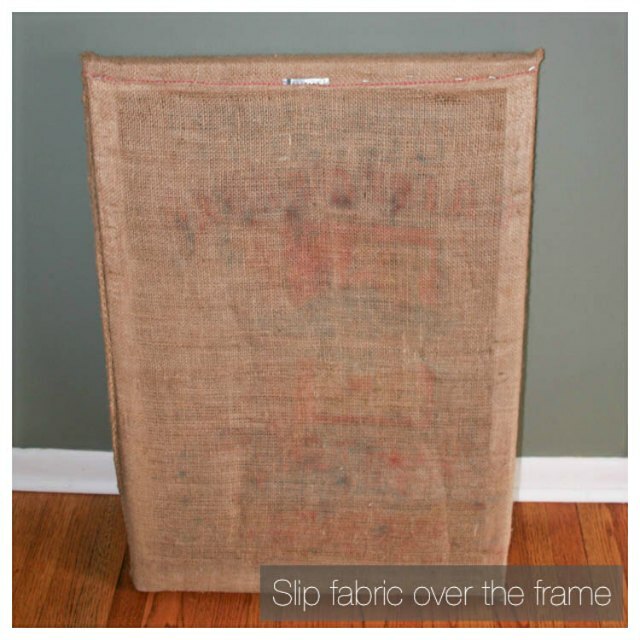 The old potato sacks we used were made of a sturdy material and their previous use made them perfect for just slipping the frames into. Fold the top of the bag over and secure it to the back of the frame with the staple gun, making sure the bag is tight the whole time. If you are using a fabric that you can’t slip the frame into, you’ll need to stretch it around the wood and staple it to each side of the rectangle. 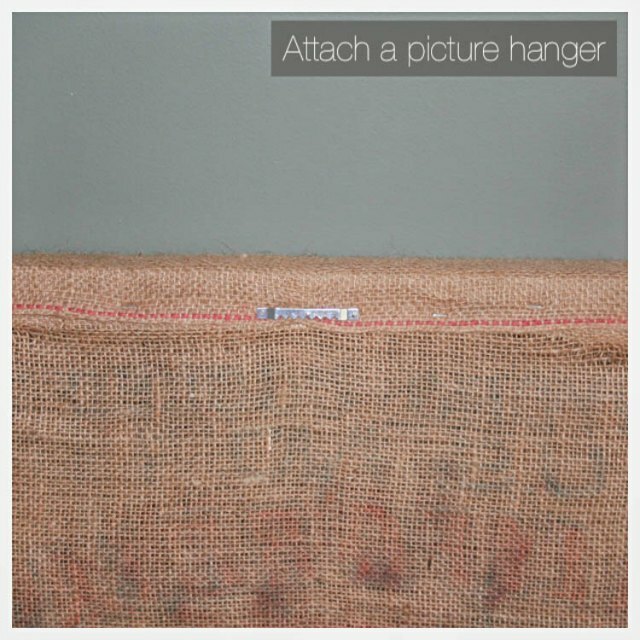 Finally, nail a picture hanger onto the back of the frame and your wall art is ready to mount. That’s it! It’s really simple, but has pretty impressive results. I’m really thrilled with our new wall art. Jennifer Tuohy writes on family, lifestyle and eco-friendly home topics for The Home Depot. 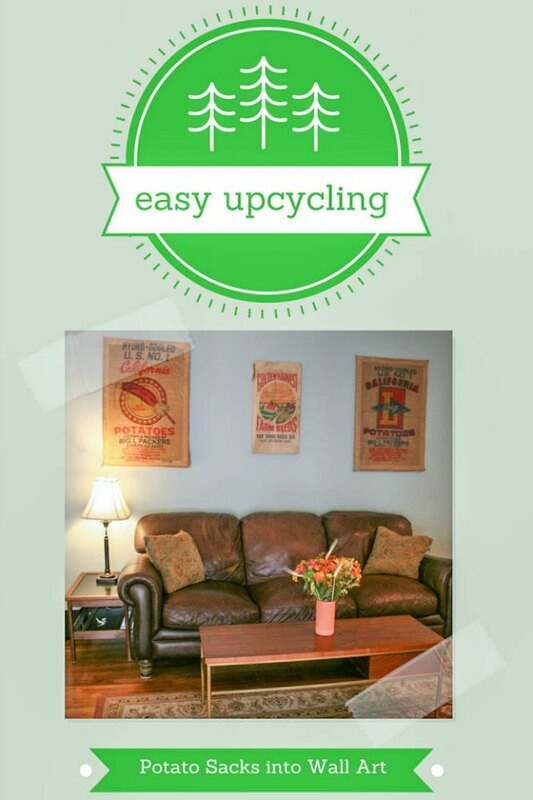 From simple DIY solutions to reusing recycled goods, Jennifer offers tips for creating with sustainability in mind. You can find the materials for this DIY project online at Home Depot.